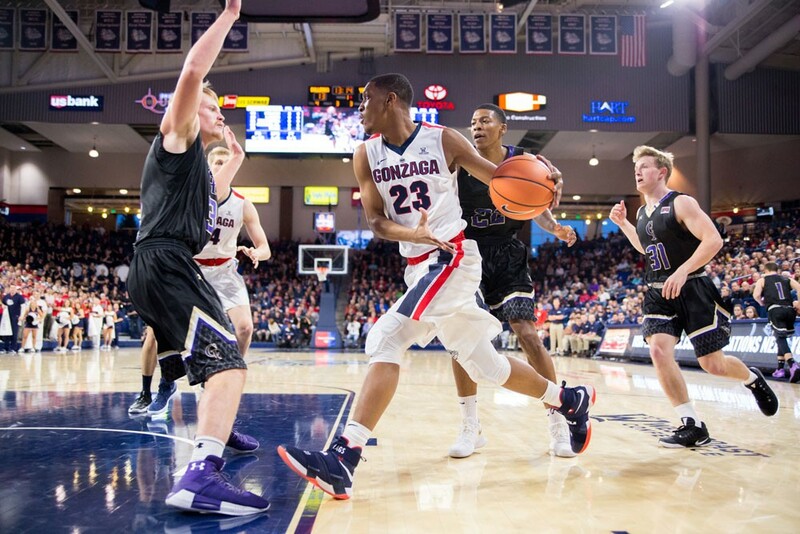 Zach Norvell, Jr., was a vital part of the Zags' beat-down of Saint Mary's this weekend. Perhaps one of the only issues a team in the top 15 like Gonzaga can dwell on is their lack of cohesive performances. It's a problem that's plagued all of the top 25 teams in college basketball, as highly ranked teams are consistently dropping games to unranked and middling teams in their respective conferences. Throughout the bigger tasks of the non-conference season and in their closer matchups in the WCC, the Bulldogs haven't been firing on all cylinders while still playing well enough to win in most cases. And after a rough shooting night in Pacific on Thursday, many had to wonder how the Zags were going to fare with one of the most efficient offensive teams in college basketball, Saint Mary's. Especially after the Gaels shot 56 percent from the field and 61 percent from three when they beat the Zags in Spokane. But the Zags found a way to make everything click, as they dismantled the Gaels Saturday night in a game where they led by as much as 22. The back court's Josh Perkins and Zach Norvell were just as vital to the outcome as the front court's Johnathan Williams and Rui Hachimura, who found a way to limit the dominance of Saint Mary's behemoth Jock Landale. In their last matchup, Landale took whatever he wanted against a Zags defense that played too deep in the key to truly limit post positioning. It resulted in a 26 points and 10 rebounds performance with an 80 percent field goal percentage for the big man. On Saturday night, Gonzaga swarmed Jock and fought for ground before he received his inlet passes, resulting in a disengaged centerpiece who only attempted four shots and had a season-low four points. Williams constantly disrupted entry passes, forcing Landale towards the baseline and into pesky trap defenses. It was a night where Gonzaga looked the caliber of the team that brought them to the championship game last year. Perkins asserted himself into the offense and Norvell showed some of the sharp shooting and quick slashing that makes him a valuable piece moving forward into March and next year. Their defense on the perimeter finally showed signs of life, as the Gaels had trouble finding clean looks. The night was a Hachimura showcase once again, as it becomes perfectly clear that his junior campaign next year will be one that leaves no question to his ability to transition to the next level. It was a sigh of relief for Zags fans as they've had to come to terms with Saint Mary's being more than a little brother in a lackluster conference. The sigh of relief may have turned into a sadist chuckle while watching a 3,500-person-filled arena decked out in "Fear the Force" react to their team getting boat-raced for the first 30 minutes of the game. Saturday night's reward for the Zags was followed by a surprising snub during Sunday's reveal of the top 16 tournament teams according to the selection committee. The Zags' value to statisticians and projectors are about as volatile as the stock market when it comes to pinning down their placement in the field. Advanced stats rankings like KenPom and Basketball Power Index have the Zags as the seventh and eighth best team respectively. But their 41st-ranked RPI and 151st-ranked strength of schedule sinks their projected placement. They are hovering around a five or six seed. If the Zags win out, they should challenge for a four seed considering their résumé of quality wins is not all too different than that of current four-seed Oklahoma. Regardless, they showed this week that they are a team that could play themselves well into the second weekend of what is shaping up to be one of the maddest of Marches.